Could you guess my Pinterest inspired project from this sneak peek? My Pinterest Challenge piece this month is a Family Rules canvas. I was inspired by this pin on Pinterest but new I couldn’t stencil anything because I am too much of a perfectionist. I knew I wouldn’t like anything that I tried to hand paint myself. So when I came across this great tip by I Am Momma – Hear Me Roar, I knew just what to do. I created my image on PowerPoint and then ordered an Engineering Print from Staples. It only cost me $1.99. I then used modge podge and adhered it to an 18 x 24 canvas. I lightly sanded over the entire print and then painted another layer of modge podge over everything. After everything that all dried, I painted the sides of the canvas black. Click HERE to get your own copy of these family rules that you can download and print yourself. A quick and easy project that I love! The engineered print is a fabulous solution to having things printed and being able to sand it like wood. I highly recommend it!! You still have time to link up your Pinterest inspired crafts, projects, recipes, and decor to The Pinterest Challenge going on HERE. We can’t wait to see what Pinterest has inspired you to make!! Sweet. And your blog looks great. Oh, I just saw that your name is Kara! That’s also the name of the crafty main character in my novel, THE BOY PROJECT, published by Scholastic this year. I’m participating in fun stuff Fridays through my craft blog. Not only do I LOVE this but I have to thank you for letting us in on the Engineer Print secret. I started a project months ago that’s a large print and haven’t finished it because I couldn’t find anywhere affordable to print it. I’m so excited I can finish it now! im obsessed with that tree!! im totally keeping my eye out for a good tree limb!! I love this…thanks for the printable as well! I am awful at designing printables and love it when people share these. You have made my day! Love these rules! Thanks for sharing! Over from linky party at Get Outta My Head!!! Cant wait to check out your cute blog! 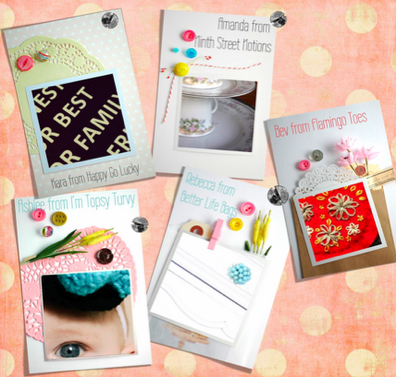 Love that printable!Would love for you to stop by and link up to the Tuesday To Do Party (if you haven’t already.) Also, the Pretty Packages Party is going on & I would love for you to share any creative gifts, packages or party favor ideas! I love this printable – what a fun thing to have displayed in your home! I am visiting from Lil’ Luna and I’d love if you would visit back! Have a great day! Super clever! And never knew about the engineering print! Thanks for sharing! Thank you SO much for linking up to Fabulous Friday. I have wanted one of these FOR.EV.ER. and this is sooo cheap and easy. I am featuring YOU tomorrow! I have seen something similar on Pinterest, and haven’t gotten around to making my own! Thanks so much for the inspiration! I am hosting my first link party today, and would love for you to add this, and anything else you like! Beautifully done Kara! Love the saying and love the black and white format! Thank you for being a part of “A Little Birdie Told Me…” Tuesday at Rook No. 17! This week’s party is in full swing and I’d be honored if you’d come by and share more of your talent! Awesome! This is great! I’m definitely going to do it! Thanks for sharing at my place! Come back and share another with my group if you can! This is so great! I just love it! That would be the perfect addition to our home 🙂 Thanks so much for sharing at Taking A Timeout Thursday! Found you in the Hop! new GFC and Linky Follower, Hope you will follow me back and check out my blog! achieve the training practice easily while boosting their own skills. to examine first the standard of the material.